thought the wine tour was fabulous"
brews. 5 stars, thanks guys!" & Brew Tours are your people! which took us to some great wineries. 100% Wine and Brew tours is a day out visiting some of the best wineries and breweries the Mornington Peninsula has to offer as well as enjoying a delicious two course lunch. Whether it be a birthday celebration, work party, hen’s day or just simply a nice day out with friends, we offer entertaining, affordable packages to suit all including your very own host to ensure your day goes according to plan so that you can enjoy your day stress free. We also offer exciting add ons to make your day that extra bit memorable. Find out more on our website or contact us via phone or email today. Please note: Availability is strictly limited, given the region and the high demand we only run a limited amount of tours at present. 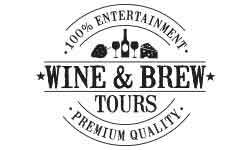 this is to make sure your experience with 100% Wine & Brews Tours, is the best possible value we can provide! © 2019 100% Wine & Brew Tours.